Located on the edge of Imperial Space, The D’Arlee Quadrant consists of 4 subsectors: D’Arlee, Yontin, Far and Zorron’s Sector. Almost half of the systems are under Imperial rule. 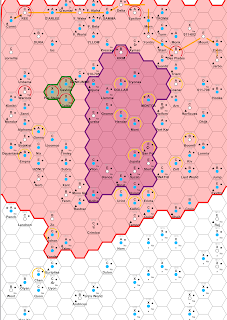 There are two smaller political regions, the League of Independent Planets and the entirely Red-zoned triplanetary system of Pax Stellar which has collapsed under internal strife and warfare more than 3000 years ago. The majority of inhabitants are human or human-derived, and there are a few known native intelligences. In fact, this quadrant has a higher than normal number of Amber and Red zoned systems. These systems have been marked either by the ISS or the Imperial Navy as off-limits for a variety of known and unknown reasons. Rumors of ultra-high tech systems to worlds of psionic mages are a constant thread throughout starport bars in this region. D’Arlee is the principle system for this quadrant. It entered the Third Imperium in 758 and was declared the subsector capital. Unfortunately, further exploration and colonization was halted as a result of repercussions from the Stumbling Years period of Imperial history. Only quadrant A was explored and colonized, and in fact, the rimward sections of Far and Zorron’s Sector have a number of systems that only have the base physical characteristics mapped. There may yet be unknown civilizations and cultures beyond the edge of known space! The D’Arlee subsector also marks the end of the X-Boat route into this section of space. There is a large private shipping company, Antares Shipping, that handles the majority of communications and mail within the quadrant. It’s Empress class ships visit multiple systems on well-defined trade routes, and is partially subsidized by the Imperium.The two other political systems, as noted, are the Pax Stellar and the League of Independent Planets. The Navy has blockaded the Pax Stellar. This was once a technological society rivaling the Darrians in terms of science. Now only ruins exist, and Imperial scientists backed by the might of a somewhat over-extended Imperial Navy keep guard over the ruins. The League of Independent Planets was created by a free trader, Anthom Trass, and has managed to maintain independent status for over 100 years now. It maintains its own space patrol in lieu of a Naval presence. There are two Naval bases within the borders, and there is some tension between Imperial authority and the more independent-minded League. There has only been a single instance of armed combat, floridly named the Merchant Massacre by the League and not even named in Imperial Navy histories, in 1100. The quadrant shares its memorable early explorers on a variety of systems. The Finnigan’s systems are somewhat prosaically named based on the order of exploration. Monk is named after Imperial Scout Tricia Monk from 801. Johan is based on Baroness Felicia D’Arlee Jo-hon.There are no known stellar oddities or hazards other than potential political unrest. The quadrant is several months from the Imperial Core and relies heavily on local nobility to maintain the peace and order as expected from being part of the grand Third Imperium.